Welcome to the OSPGD F&Mily! 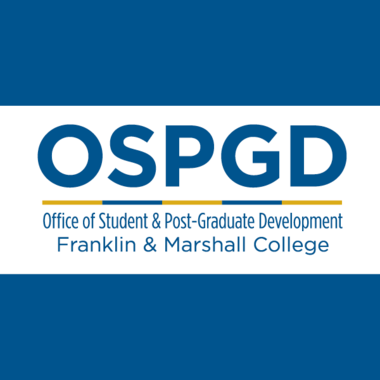 The Office of Student & Post-Graduate Development looks forward to supporting your students during and after their time at Franklin & Marshall. We will help them identify, explore and compete for extraordinary opportunities, and support them after they graduate through ongoing career advising, progressive programs and on-demand resources to sustain them in fulfilling career trajectories. We welcome you to partner with us in this work with your experience, insights about and credibility with your students. One of the important ways you can help us support your students is to encourage them to connect with us early and often. For students who have ideas about desired career pathways, we can connect them to resources, professionals and opportunities along those pathways. For those who do not have ideas about potential career pathways, we can help them "try on" pathways through externships, internships, alumni connections and other resources specific to their interests. The more exposure the students have to us and vice versa, the more effective a partner we can be in preparing them to launch into their lives after graduation and support them in the years which follow. Additionally, information for Parents and Families can be found here. OSPGD's calendar details many of our events and programs for students and alumni. To access the most recent F&M Parent Newsletters, click here. Thank you in advance for your support of and dedication to students and alumni. If you have any questions about our services, or suggestions about how we can improve what we do, please do not hesitate to contact me. In 2012, F&M transformed the concept of traditional career services by launching the Office of Student and Post-Graduate Development (OSPGD), which prepares students for success in life, and not just work, beyond college. In this webinar, you will learn how OSPGD engages students early in their college career and continues to support them even after they graduate with career advisement and professional development opportunities. You will also understand how you can partner with OSPGD in supporting your students, while staying aware of OSPGD’s offerings and services. Click here to view. Join us for a discussion about the curricular, extracurricular and work experiences that can increase your students' salability to employers for summer and post-graduate opportunities and graduate school admission, and how OSPGD supports your students in preparing them for success beyond F&M. Click here to view. What innovations and developments are shaping the future of work, and job design? What are the implications for your students as they prepare for success in their lives beyond F&M? In this webinar, we will answer those questions, and discuss how F&M is preparing your students now for the workplace and job market of the future. Click here to view. More than half of F&M graduates study off-campus at least once before they graduate. There are over 150 programs in 50 countries that they can choose from while studying at F&M. In this webinar, Ali E. Janicek, Assistant Dean for International & Off-Campus Study, will discuss the variety of program opportunities, how credits transfer, cost and financial aid, online resources, as well as how you can best support your student during such a unique experience. Click here to view. OSPGD works closely with employers as thought partners, helping them craft and gain a better understanding of what makes our students competitive across industries. At the same time, OSPGD coaches students on sharpening their skills early in their undergraduate career so that they can achieve the core competencies necessary to succeed in their post-graduate journey. In this webinar, Sonia Elliott, M.S.Ed., OSPGD's Director of Employer and Community Partnerships, will discuss how students can develop a competitive acumen early in their college tenure, and what employers expect from today's college graduates. Click here to view.